The Nokia Lumia 1520 appeared today in yet another leaked photo, this time in a bright hot-rod red. Well-known Twitter leakster @evleaks came through again on this one after publishing a leaked press shot of the yellow Lumia 1520 in early September. 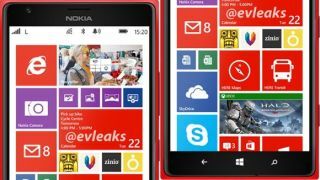 Like that photo, today's leak came with a brief but factoid-focused caption: "Nokia Lumia 1520, in red, 2013," evleaks tweeted. The suggestion for a 2013 Lumia 1520 release date matches what the source previously claimed, as well as our expectations of an Oct. 22 Lumia 1520 launch. Previous reports hinted at a Sept. 26 reveal for the Lumia 1520, but the device was reportedly delayed until Oct. 22. That delay may have been caused by Microsoft's purchase of Nokia's device business. The Lumia 1520 is thought to be the largest Windows Phone handset yet, with a display that could come in at a full six inches. The Windows Phone phablet has been spotted in previous image leaks, some of which compared it to other, smaller devices to show off the Lumia 1520's considerable bulk. There's not been much word in terms of the phone's other specs, though it's not expected to carry a 41-megapixel camera like the Lumia 1020. Instead it could have a still-powerful 20-megapixel camera. A quad-core Qualcomm processor is also rumored. Expect to learn more about the Lumia 1520 this month - that is barring any further delays, of course. Big changes are coming to Windows Phone 8, possibly including a personal assistant that could be named after Cortana from Halo!